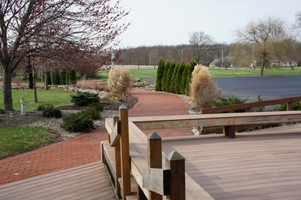 The Chapel’s Memorial Garden was completed in 1999, with the expert assistance of Millgrove Landscaping, as a means of witnessing to the lake community as it drives by of the natural beauty of creation. The garden fulfills several functions for us. Beyond the obvious curb appeal of the garden itself, it provides a place for the Chapel to give witness to our belief in the communion of the saints. The garden allows one generation an opportunity to offer to the next generation their legacy of love and witness. The gifts and bequests the garden will receive will help sponsor the Chapel’s ministry for years to come. Second, the garden embodies a witness to God’s grace in creation. The Sabbath blessing of the original creation can still be experienced. As a place of beauty and rest, the garden incarnates our Christian witness and the essential link we see between creation and redemption, a silent witness heard the year-round. Finally, the garden provides not only a place of remembrance and rest. It also provides a compelling witness to the Chapel’s enduring commitment to the stewardship of creation. The Chapel’s unique ministry setting in the natural beauty of the lake community of Steuben County makes the stewardship of creation one specific social justice issue which the Chapel naturally champions, as is evident in another environmental witness of the Chapel, the Blue Heron Ministries. The garden embodies this witness and speaks well of the Chapel’s respect and care for creation which is required of all of us as we seek to pass on to our children a clean and healthy environment. And the garden embodies…literally…the witness of the saints from one generation to another of the faithful love of God.